If you're unfamiliar with Wicked Polish, it's no less than one of the emerging indie brands right now. I discovered Rylee and her beautiful creations on Instagram and today I have her entire Pestilence collection to share with you! Pox : neon pink and orange translucent matte glitters in a sheer milky base, small, medium and large hexes. One coat over OPI Alpine Snow plus topcoat. Gangrene : neon yellow and green translucent matte glitters in a sheer milky base, small, medium and large hexes. One coat over OPI Alpine Snow plus topcoat. Hematoma : neon purple and blue translucent matte glitters in a sheer milky base, small, medium and large hexes. One coat over OPI Alpine Snow plus topcoat. Hung-Over The Rainbow : rainbow translucent matte glitters in a clear base, small, medium and large hexes. One coat over OPI Alpine Snow plus topcoat. Pink Eye : matte pink, white and silver glitters in a bubblegum pink base, small, medium and large hexes. One coat over OPI Pink Friday plus topcoat. Priapism : bright pink shimmer and iridescent blue glitter in a blurple jelly base. One coat over Kiko 337 plus topcoat. Frostbite : matte white and turquoise holographic glitters in a clear shimmery base. One coat over Priapism / Kiko 337 plus topcoat. 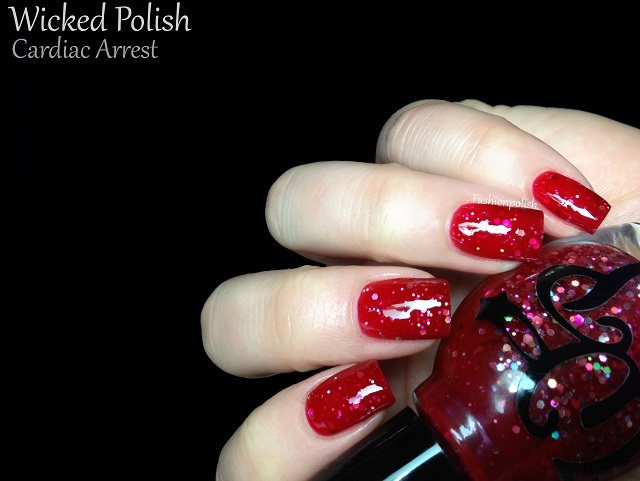 Cardiac Arrest : red jelly base with different sizes of silver holographic glitters. Two coats on its own plus topcoat. Black Lung : dark gunmetal shimmer with medium black and small silver holo glitters. One coat over Kiko 382 plus topcoat. I love the entire concept behind this collection. I'm not usually a fan of white based glitters but Pox ended up being one of my favorites! My top choices : Priapism, Frostbite, Cardiac Arrest and Black Lung! Wicked Polish retails for $10 each and can be purchased directly from wickedpolish.com (restock today noon pacific time) or harlowandco.org. 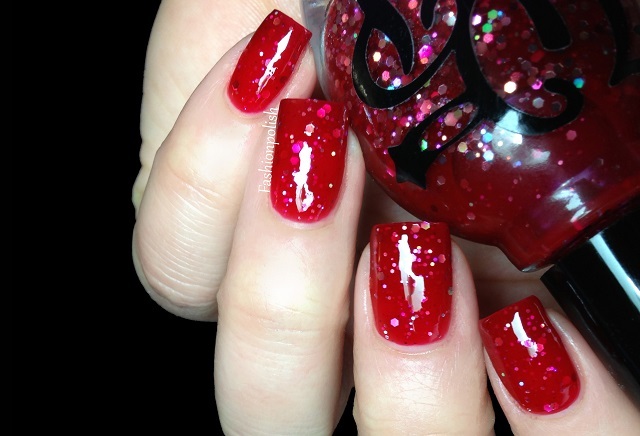 For more information, please refer to Wicked Polish's blog, Twitter or Facebook. Seriously gorgeous polishes and swatches! oh, i'm so in love...gorgeous! I love all of these, but especially Black Lung! Rarely do I like ever polish in an indie brand's collection but I LOVE ALL OF THESE. So pretty! Oh wow! These are just perfect nail polishes <3 Love them! Priapism. That name... But it's so pretty! I really really like this collection! I love the compositions of you photos! And ohemgee, the polishes are so gorgeous! I like all of them but I completely fell in love with Pink Eye, Priapism and Black Lung! This collection is so awesome! Wow, all colors are amazing. I like Pink Eye very much. Priapism is blue... *snigger* god i'm immature..